In Kabul, Afghanistan—which I (Storm Cunningham) was fortunate to visit prior to the Soviet invasion that triggered the decades-long nightmare that has afflicted this beautiful country—the 12.5 hectare (31 acre) Chihilsitoon Garden had lain in ruins for 26 years. 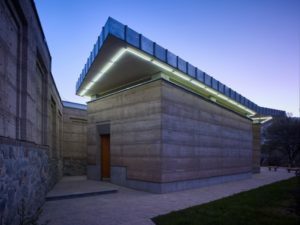 But now, a project by the Aga Khan Trust for Culture has restored the site to its former glory, incorporating some 10,200 square meters of renovated and new rammed earth buildings to provide high-quality facilities for visitors. Formerly a 19th century royal garden transformed in the early 20th century into a state property housing visiting dignitaries—including most notably U.S. President Dwight D. Eisenhower and Soviet Premier Nikita Khrushchev—the site had been heavily damaged and looted during the internecine conflict of the early 1990’s. The project began in early 2015 and was completed by mid-2018 with a €15.1 million budget provided by the German Federal Foreign Office through the KfW Development Bank and entailed extensive partnerships with local communities, Kabul Municipality, and the Ministries of Culture and Urban Development. 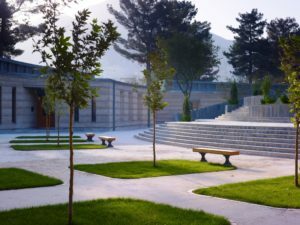 Rehabilitation of the Chihilsitoon garden is the largest project carried out to date by the Aga Khan Trust for Culture, which has completed more than 140 restoration and landscaping projects across Afghanistan since commencing its work in 2002. On the basis of an architectural program developed jointly with local authorities, incorporating existing site functions for sport and recreation, the landscape plan called for the creation of a variety of spatial experiences resulting from the linkage of distinct programmatic spaces through a network of formal paths and trails. A historic formal axial garden forms the core of the site, surrounded by informal patches of dense landscapes and open lawns, with nodes of activities inserted along its longitudinal spine. 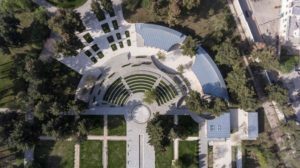 These include family picnics areas, an outdoor amphitheatre, and the historic formal promenade (containing original marble fountains) which were restored and made functional again. The continued use of the site for sports activities required the construction of a distinct zone containing cricket batting areas, volleyball fields and two mini-football pitches. An indoor facility was constructed to enable sports teams’ access to changing facilities and showers, promoting the use of the sports fields for competitive matches. In addition to planting more than 5000 new trees, saplings were provided for maintaining the stock of trees and plants within the garden and a commercial horticulture nursery was constructed in order to generate additional revenue towards the upkeep of the site. Contemporary designs for new buildings were based on the reinterpretation of vernacular forms and typologies by AKTC’s in-house team of architects and planners with in-depth knowledge of local building methods and materials. As a result of this process, rammed earth was selected as the main building material early in the design stage. 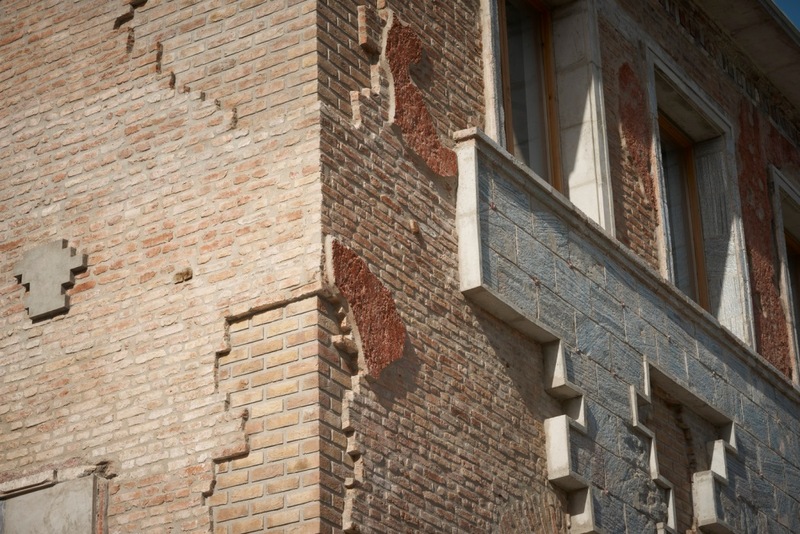 Found to have been used in parts of Afghanistan as far back as the 2nd century A.D., rammed earth structures are highly suitable to the climatic and ecological environment in the region. Due to the workability of rammed earth, a range of architectural designs were explored for the various facilities. Reinforced with bamboo trees, steel rebar, and concrete frame structures, buildings constructed with rammed earth were designed to withstand moderate earthquakes. New buildings in the garden include an exhibition hall, 300 seat auditorium, visitor management and administrative facilities, and a multi-purpose facility within the reconstructed historic palace. Together these facilities provide essential space for administrative and maintenance functions, while significantly increasing the capacity of the operations to plan multi-purpose events. Retail units, food kiosks and restaurants have been built into the park to generate sustained revenue for the operation through the hire and use of these spaces. Provisions have been made for on-site utilities, which will ensure that the garden is properly maintained with limited usage of water and electricity, and septic systems that percolate filtered wastewater through subsurface leach fields. 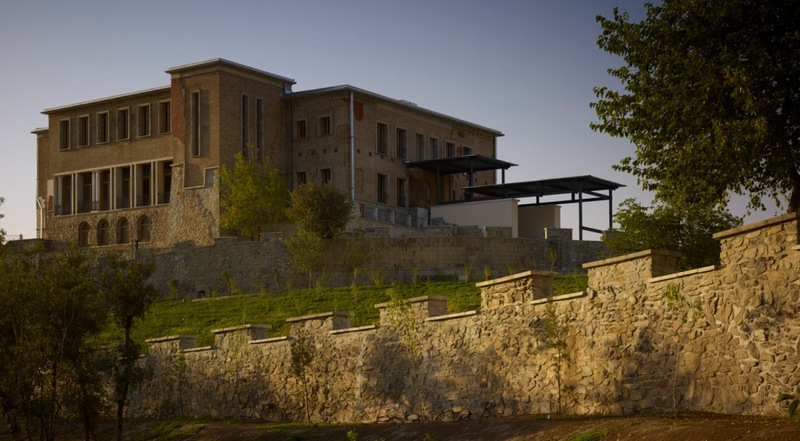 The rehabilitated Chihilsitoon Garden provides users with a safe and secure environment to experience, interact, exchange within landscapes and facilities designed to contain and promote the country’s rich cultural expressions and social history. 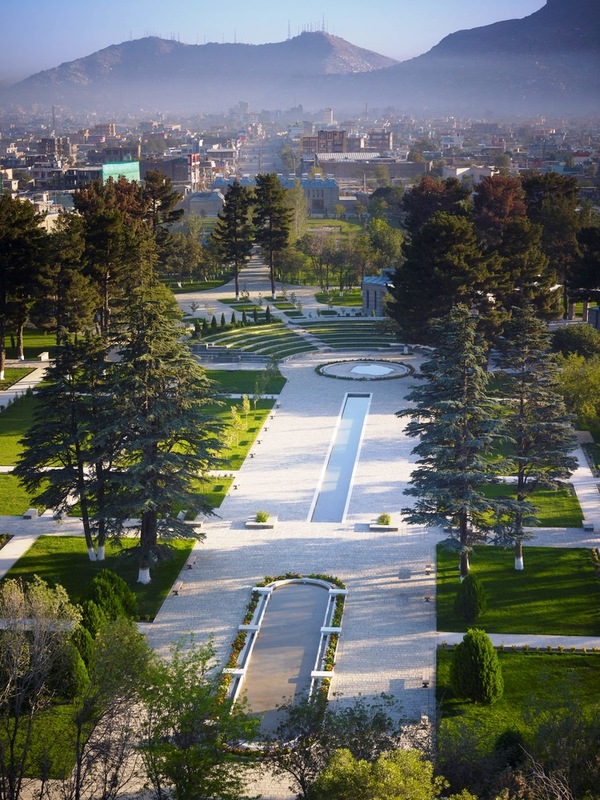 The garden will be managed by the newly formed independent Kabul Historic Gardens Trust, which has been mandated to operate the city’s historic public gardens, building on more than a decade’s experience of sustainably operating Babur’s Garden. All images courtesy of the Aga Khan Trust for Culture. See the Aga Khan Trust for Culture website.